PSA will go ahead with new launches such as the Peugeot 3008. PSA/Peugeot-Citroen made a net loss of 343 million euros ($443 million) for 2008, the company said Wednesday. In 2007, PSA made an 885 million euro net profit, but the French carmaker was hit hard by a big slump in new-car sales toward the end of last year. PSA said its profitability took a large hit from the collapse of global automotive markets in the second half and a significant reduction in production in the fourth quarter to reduce inventory. CEO Christian Streiff said he expects 2009 to be loss-making for the group with the first half particularly difficult, but said the company aimed to return to profit in 2010. "Faced with the prospect of a prolonged recession, our priorities are clear. We must concentrate all our efforts on reducing inventory and minimizing our cash consumption," Streiff said in a statement. PSA expects western European automotive markets to decline 20 percent in 2009 and stabilize in 2010. Streiff said all PSA's model launches will go head as planned this year. 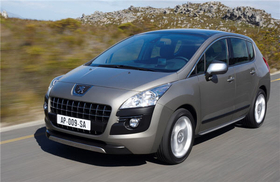 These include Peugeot's first medium minivan as well as the 3008 crossover and the 308CC. Citroen will introduce a new global brand image and launch the C3 Picasso. Streiff said PSA's 2009 sales and manufacturing funding needs of about 4 billion euros will be covered by a government loan and finance from other sources. The French government is loaning PSA and domestic rival Renault 3 billion euros each at an interest rate of 6 percent. PSA said it maintained its global market share in 2008 at 5 percent despite vehicle sales falling 4.9 percent to 3.26 million units. The group's Western European market also share stayed the same at 13.8 percent. PSA's European sales declined 8.6 percent to 2.13 million. Unit sales fell most in Spain (30 percent) and in the UK (17.1 percent). Sales rose in Germany (2.1 percent) and in France (1.9 percent). The group's automobile division revenue fell 8.5 percent to 41.64 million euros. Its operating loss was 367 million euros, compared with a 1.12 billion euros operating profit in 2007. PSA said its 2008 revenues were down 7.4 percent at 54.4 billion euros. Its current operating margin fell to 1 percent of sales from 3 percent in 2007.